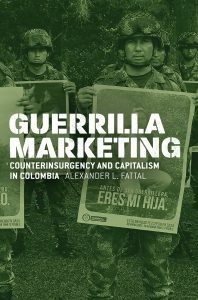 In his new book—Guerrilla Marketing: Counterinsurgency and Capitalism in Colombia—Alexander L. Fattal takes a detailed look at the Colombian government’s efforts to transform Marxist guerrilla fighters in the FARC into consumer citizens. In doing so, he illuminates a larger phenomenon: the convergence of marketing and militarism in the twenty-first century. We sent Fattal a few questions to learn more about his research for the book, his recent reads, and his motivations to delve into this topic. The best, hmm, I’ll pick two Chicago titles. Not because this is the UCP blog, really. W. J. T. Mitchell’s Cloning Terror: The War of Images, 9/11 to the Present and Susie Linfield’s The Cruel Radiance: Photography and Political Violence. Clearly I have a thing for smart, reasonably polemical books about the representation of political conflict. How did you wind up in this academic field, and what do you love about it? I became an anthropologist because I loved fieldwork. It’s trite but true. What I love about academia is the relative autonomy. Right now I’m finishing a short film called Limbo. It takes up some of the themes of Guerrilla Marketing by focusing on one former FARC fighter. The film was recorded in the payload of a truck that I transformed into a giant camera obscura, which became a surreal, confessional space in motion. I’m not sure what other career gives you the freedom to do a project like that. Of all the books you could have written, why did you decide to write Guerrilla Marketing? I don’t know, it feels like there was some magnetic force pulling me toward writing this book. My dad is in the marketing world; he runs a small paper and is always hustling folks to advertise. My mom got an MA in Art History and there were always art history books in the house. I remember going to one of her lectures as a kid and she was analyzing a tray of images. When I got access to the program that is at the heart of Guerrilla Marketing, I saw marketers creating symbolically dense images and something clicked. I was just getting into Colombian politics, and when I witnessed the first focus group that the military was conducting with former guerrillas I knew I had found the ethnographic ground for the book I wanted to write. Where do you usually write? What is your work space like? I wake up early and sit down at my desk, which is just a giant slab of wood I got from Home Depot during graduate school that sits atop two filing cabinets. Last year I got fancy and put two coats of Golden Oak stain on it. I try to keep the desk clear of clutter but inevitably there are small piles of paper and books for different projects. My first writing session tends to be my most productive: one cup of coffee, pre-breakfast. I take small pauses to glimpse different moments of the sunrise. What recent or forthcoming book from UCP are you most excited about? I can’t wait to get my hands on Deadline: Populism and the Press in Venezuela (out in July) by Robert Samet. 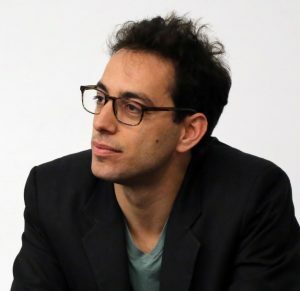 It couldn’t be timelier, not only for understanding the ongoing implosion in Venezuela but also for delving deep into the relationship between media politics and populism. I’m awaiting a really smart mix of theory and ethnography. Guerrilla Marketing: Counterinsurgency and Capitalism in Colombia is available now! To learn more or buy a copy, visit the book’s page on our site or visit your local bookstore. You can also follow the author on Twitter and check out his website for more info about his work.